Troy was defeated after a 10-year siege, it is remembered as a subject of legends, and the names of this war’s heroes, Agamemnon, Odysseus, Achilles, have become immortal. The heroes’ wives and their difficulties have had quite a few mentions in literature and film. But what became of the losing side, the women, the children? 700 years after the destruction of Troy, the Greek playwright Euripides wrote two tragedies about the Trojan women, with Queen Hecuba as a central figure, but still from a Greek and male perspective. 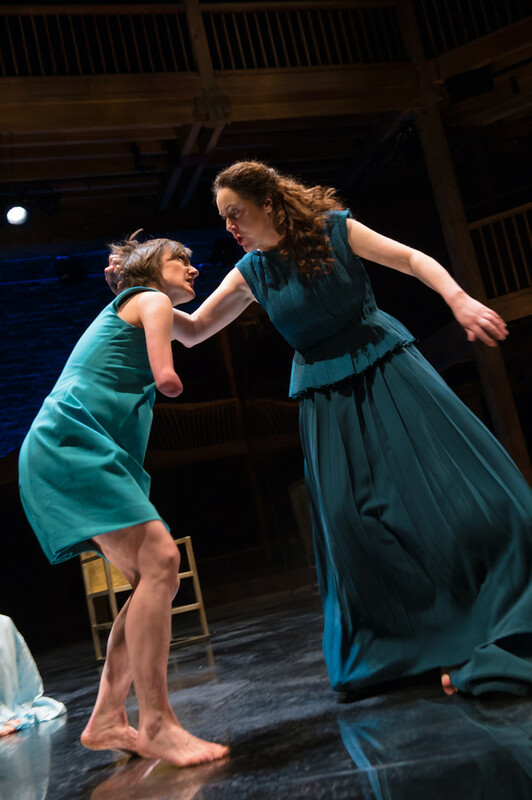 The new version by Marina Carr, Hecuba in the Swan Theatre, Stratford-upon-Avon, sees the events through the eyes of these female characters. Based on and deviating from Homer’s Iliad and Euripides’ Hecuba, the emphasis is with those whose world breaks apart. However, Carr also finds words for the traces that this war left behind in the winners’ souls. A very specific narrative style, in which the characters also take over the function of narrators and commentators, casts a dense spell, right from the outset. A drama that literally takes your breath away, an emotional tour de force ride and a deeply captivating experience. 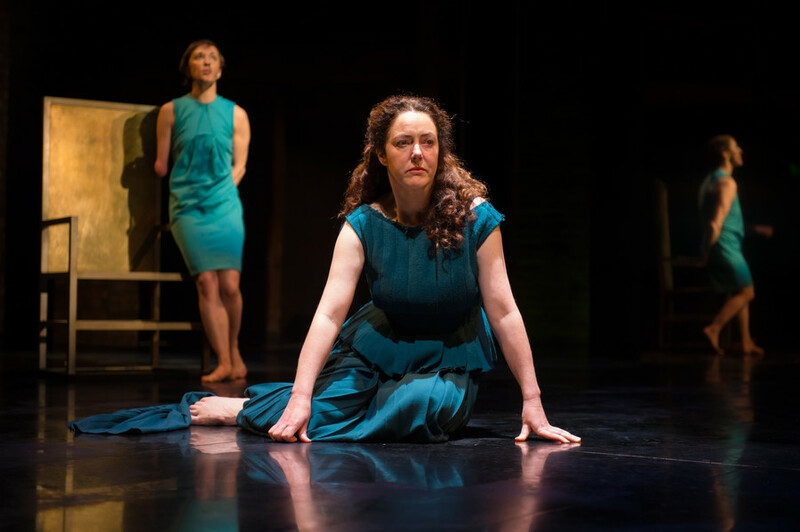 Dearbhle Crotty in the role of Hecuba lets the audience feel her fathomless fall, the loss of her children, her husband, her role in life – an incredibly sensitive and heartbreaking portrayal. 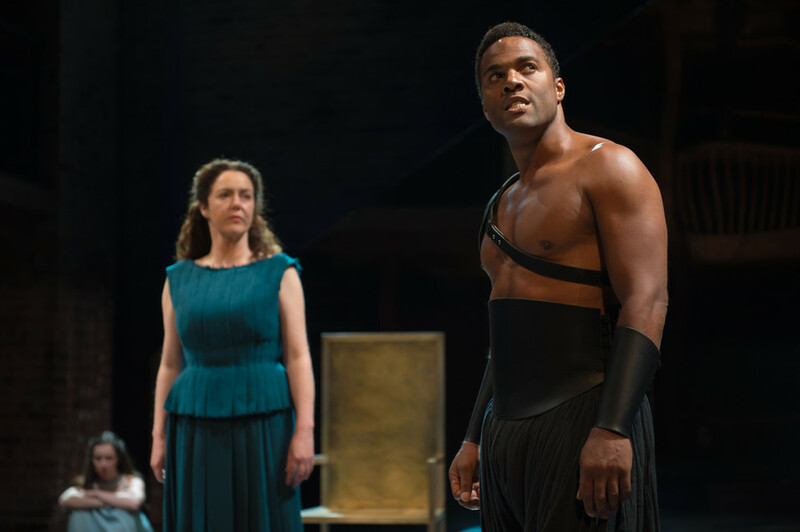 Opposite her, Ray Fearon as Agamemnon, the victorious commander, whose superiority seems to be hanging by a thread. Fearon masterly shows the hero’s emotional set-up, damaged by his own actions as much as by what he experienced, and despite all that not enabling him to prevent further atrocities. Nadia Albina is Hecubas daughter Cassandra, the seer. Annoying and unloved due to her prophecies, she becomes the cynical outsider. Breathtakingly raw, irreverent and troubling. Her sister Polyxena, played by Amy McAllister, is her exact antithesis – gentle, almost childlike, very delicately depicted. A fabulous performance by the young actress in her RSC debut. Lara Stubbs convinces as Hecuba’s woman Xenia, but especially when she takes on the singer’s part, who with short elements of laments turns the struggle of human beings against their intolerable fate into darting flames of sound that seem to exist outside of time and space. Powerful stuff! Edmund Kingsley is a disturbed Polymestor, commissioned as protector of Hecuba’s youngest son and like him and his children a pawn of war. 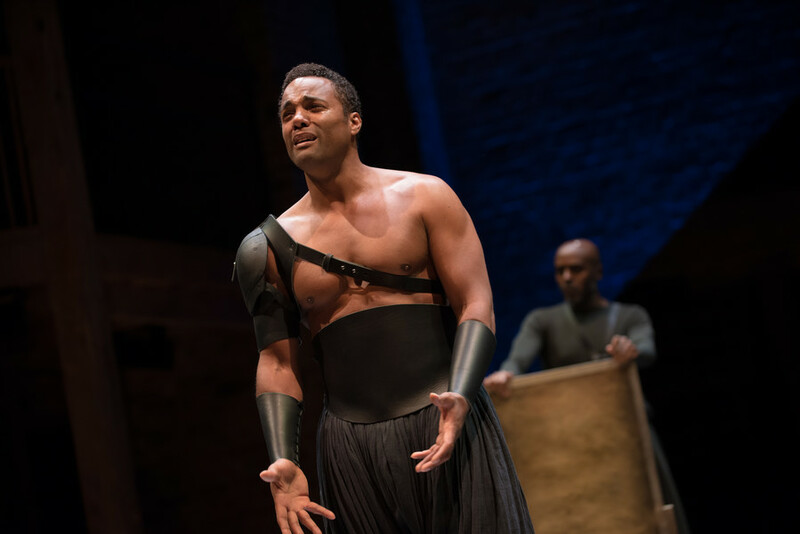 Chu Omambala represents Odysseus as a cynical war technocrat and David Ajao is the fatherless and yet compassionate Nepotolemus, Achilles’ son. Polydorus, Hecuba’s last surviving son is played by alternating young actors – absolutely impressive, Nilay Sah, Luca-Saraceni-Gunner and also Marcus Acquari. Massive applause to Erica Whyman’s direction and the music composed by Isobel Waller-Bridge, played under the direction of Candida Caldicot. This entry was posted in Theatre and tagged Agamemnon, Amy McAllister, Andrew Franks, Ayse Tashkiran, Cassandra, Charles Balfour, Chu Omambala, David Ajao, Derbhle Crotty, Edmund Kingsley, Erica Whyman, Euripides, Hecuba, Homer, Isobel Waller-Bridge, Lara Stubbs, Nadia Albina, Odysseus, Ray Fearon, Royal Shakespeare Company, RSC, Soutra Gilmour, Stratford-upon-Avon, Swan Theatre, Troy on September 30, 2015 by lingonews.